Midway Building Materials got its name due to its location midway between Ontario and Pomona, although as the years passed the location on Holt Boulevard at Ramona Avenue was absorbed into Montclair. Ric Pearson opened Midway in 1952 and closed it in 1998. A Jack in the Box, SavOn and Albertsons and CVS are there now. The business was probably known for its products among the contractor set, but most of us knew it solely from its neon sign, in which a bricklayer endlessly moved his trowel and the stack of bricks grew. 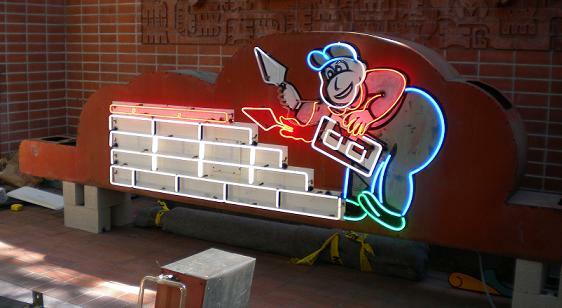 The sign, created by Ontario Neon, was donated to L.A.’s Museum of Neon Art in 2002, thanks to the urging of the city of Montclair. The sign is currently in storage, as the museum is planning a move to Glendale, but two years ago it was briefly back in the 909. The sign was part of a neon display at the L.A. County Fair’s Millard Sheets Center for the Arts in 2010, where I shot these two photos, the trowel in a different place and the stack of bricks different in each, and then promptly forgot about them. I was surprised to learn recently that I’d never posted about the sign or the business. Let me rectify that now. Posterity demands it. And my admiration to the bricklayer, who’s been stooped over for 60 years — but still manages a smile. Made many trips to Midway with my Dad in the 50s. In those days, you had to build your own wall if you wanted one around a tract home yard. Somewhat uniquely for a neon sign, this one was mounted on the ground, not on a pole, so it looked liked the mason was really building a wall. “Posterity demands it” — as does that posterior! This is one of those things I didn’t notice was missing, but now that I see it I definitely remember it! I never patronized Midway, but I must have driven by there plenty of times in the 70s-90s. It’s good that the city of Montclair urged them to save it and donate it to the museum. The older I get, the more important it seems to keep track of things past. Dave, I’m pretty sure there is no Albertsons or SavOn located on Ramona & Holt. The Jack In The Box I do recall next to a CVS I believe. Just wondering as I read this. Perhaps that was built at first when they closed down? I saw Dave Svenson [class of ’71] who works with neon, restoring a Midway Builder sign, possibly a companion to that piece at the LA County Fair’s Art Building last year. My dad also went there in the 60’s and he would ask me if I wanted to go. He didn’t have to say it twice.They just don’t make them like they use to, glad to see it’s being taken care of. I remember this place well. When I owned my first home with Paul Plaster (first husband) we bought many supplies from Midway. I love those neon signs! Thanks for the story about this sign. I had not thought of it for years. It was just always “there”…from single digits through my 20’s. I would be riding in the back of my parents car and see the sign…must have been 100’s of times. It was kind of a friend…always there, always smiling and working. The world, and my little world, were reassured by this character just working away. He always smiled at me no matter what. Funny how a neon sign would have that impact on me. I guess it is because he was a “constant” in my life and it seems the “constants” have all but disappeared. Thanks again for being in touch with my Southern California.